Thank you for your interest in joining Team Animal League, and running in the 2019 United Airlines NYC Half Marathon on Sunday, March 17, 2019. Please complete the application below to apply. Once we receive your information, someone will be in touch with you within 48 hours. Please select your runner level and fill out the information below. 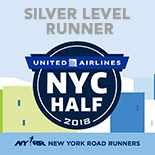 Gold Level Runners are given guaranteed entry into the 2019 United Airlines NYC Half Marathon. Approved applicants must commit to a fundraising minimum of $1,000. Silver Level Runners must already have an entry number from New York Road Runners for the TCS NYC Marathon 2018. Approved applicants must commit to a fundraising minimum of $350. Enter only if you already have an entry number from The New York Road Runners for the 2019 United Airlines NYC Half Marathon. Runners must be at least 18 on the date the event commences in order to participate. Gold Level Runners must choose $1,000 or more. Please check the box above. Doing so helps prevent automated programs from abusing this website. *All runners will be asked to fulfill their fundraising minimum by March 15, 2019. All fundraising proceeds and deposits will be considered a charitable donation to the Animal League and we will send you confirmation of this donation for tax purposes. In order to ensure that as much of your donation as possible goes back directly supporting the dogs, cats, puppies and kittens of North Shore Animal League America, all runners will be responsible for additional costs such as NYRR registration fee, transportation and hotel accommodations.